Ah autumn – cooler weather, brilliant colours, shorter days and the heady scent of the earth as it prepares itself for winter. The change in seasons brings with it the chance to witness one of nature’s more poignant spectacles – the salmon run. 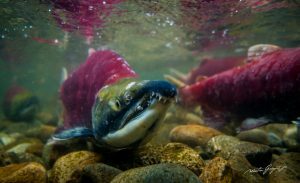 Each year, in rivers and waterways across BC, thousands upon thousands of salmon of varying species swim through hundreds of miles of ocean, past predators and fishermen’s nets, through raging rivers, and up waterfalls to finally arrive back to the place of their birth, where they mate and bury their eggs in the stream bottom before they die. This enthralling event is one of nature’s most fascinating rituals, and the ultimate example of the circle of life. In British Columbia there are multiple locations to watch this drama unfold and BC Parks offer some of the very best vantage points. Here are a few of the provincial parks you can visit to experience a salmon run. Each year from late October through December , in Goldstream River, chum, Coho and Chinook salmon enter the river via Finlayson Arm from the Pacific Ocean. They are returning to their birthplace after 3 or 4 years. Chum salmon spawn in November; Coho in November and December; Chinook in late October and early November. To get here: Goldstream Provincial Park is located 16 km northwest of Victoria on southern Vancouver Island on the Trans Canada Hwy (Hwy #1). The best viewpoint is in the day use area: the entrance to the day-use area is at the junction of Trans Canada Hwy #1 and Finlayson Arm Road. The park features the annual run of thousands of Pacific salmon circling in the pool below Stamp Falls before ascending the fish ladders on their way to spawning beds. Lookout points along the river offer excellent views of the salmon fighting their way up the falls and fish ladders. The best time to view the runs: Coho salmon in October, Chinook in September and October. To get here: Stamp River Provincial Park is located northwest of Port Alberni on central Vancouver Island. Follow Hwy #4 past Port Alberni and turn onto Beaver Creek Road. Follow signs to the park. Five species of salmon make their presence known in Campbell River, the self-proclaimed “Salmon Capital of the World.” There are many options for viewing Pink salmon in September, Chinook in October and November, and Coho from October through December. The best viewpoint is from the Quinsam River Viewing Platform: A concrete platform just below the Quinsam River Highway Bridge provides a view of a holding pool for salmon. In the fall the holding pool contains Pink, Coho and Chinook while on their way upstream. The trail is 60m from the parking area, and is located across from the Quinsam River Campground in Elk Falls park. To get here: Take Hwy. 28 west from its junction with Hwy. 19, turn left on Quinsam Road (one block past junction) and follow the signs. The Adams River is home to one of the largest sockeye runs in North America—a fact that draws nature lovers to Roderick Haig-Brown Provincial Park each October. It’s an awesome sight: the river teems with red-and-silver salmon as they make their final journey upstream. While 2016 is not a dominant year (the peak numbers of salmon are reached every four years; the next apex will be 2018), spectators are sure to thrill at the natural wonder, thanks to viewing platforms on site. Best time to visit is in October. How to get here: The entrance to Roderick Haig-Brown Provincial Park is five kilometres (three miles) from Squilax on the Squilax-Anglemont Highway. Which provincial parks are open for tent camping through October?